Edvard Munch: "The Scream" (1895). Photo: Halvor Bjørngård. Copyright: The Munch Museum. For the first time, all of Edvard Munch's drawings have been digitalised and made available to the public. Edvard Munch drew throughout his life. He kept almost everything, from simple doodles to thoroughly developed and detailed motifs. You can now become acquainted with Munch the draughtsman without leaving the comfort of your home, by flipping through all the preserved works in the Munch Museum’s digital catalogue raisonné. The catalogue comprises more than 7600 unique drawings. About 90 percent of these are part of the Munch Museum’s collection. Most of the drawings are completely unknown – only a small number of them have ever been exhibited. The digital catalogue contains sketches, notes and illustrations that give a thrilling insight into Edvard Munch’s artistic process. You will be able to follow the development of his distinct style through different periods of his career, and see how he shaped some of his most famous motifs. 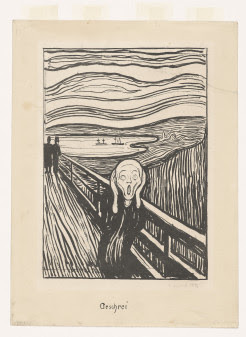 The work of cataloguing Edvard Munch’s drawings is supported by the Bergersen Foundation.